This article may contain outdated information that is inaccurate for the current version of the game. It was last updated for 1.3. Please help improve this article or section by expanding it with: descriptions for each section. More info on surrender. Land warfare is warfare on land. Land warfare is performed by divisions, subdivided into Brigades. Divisions form an army together which may be led by a commander. Each commander can effectively deal with 24 Divisions. Five Armies can be led by a Field Marshal. Air warfare is warfare in the air. Air warfare is performed by air wings containing airplanes, who may compete over the air superiority in a certain strategic region with the enemy, bomb enemy factories, airfields and infrastructure, provide close air support for land divisions and attack ships that are either docked or on active missions. Air wings are not led by commanders but may generate skilled pilots, called aces, who may give bonuses. Naval warfare is warfare at sea. Naval warfare is performed by fleets containing ships, who may compete over the naval superiority in a certain naval strategic region as well as interrupt enemy convoy activity and defend friendly convoy activity. Fleets are led by Admirals, which can provide bonuses depending on rank and skill. This section may contain outdated information that is inaccurate for the current version of the game. The last version it was verified as up to date for was 1.3. Capitulation is a process that occurs during warfare when the percentage of a country's victory points under enemy occupation exceeds the country's national unity. This calculation is not the same as Hearts of Iron III - every province counts at least one point towards the victory point total, named cities count 10x their displayed Victory Point level. One still needs to capture the main Victory Point cities, but the large number of unnamed provinces can add up to a significant amount either in their home land or overseas. When a country capitulates, it will lose all troops in home territories and either retreat to distant colonies or ally states. Furthermore, all core provinces (and provinces contiguous with core provinces) without allied troops occupying them will be lost to the enemy with the most occupied victory points. Capitulation does not mean instant defeat for a country. If the country is in a faction, the war will not be over until all major faction members are defeated (the only factions that count are those directly involved in the war); this means minor nations may also be forced to surrender in a war even when they themselves did not fall. Establishing occupation of enemy provinces (changing control from enemy to friendly flag). Other friendly troops entering or remaining in the province later on do not gain occupation score. Occupation score is not lost by giving territory to another friendly power to occupy. Losing Manpower while combating the enemy - those whose blood buys victory shall have a share in the spoils. Each action accumulates score, which is then compared to the overall score of the alliance to produce a percentage of war participation. This score is used during peace conferences. It also affects requests to an ally to hand over control of an occupied state in wartime. When a war has ended, and all enemy nations defeated, a Peace Conference will be launched. Volunteers and Expeditionary Forces are ways of sending soldiers to wars without having to be a part of the war or by sending troops to allies in a war to aid them. 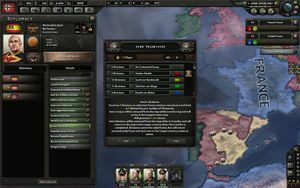 Sending army divisions or (as of the (1.5.0) Cornflakes update) air wings as Volunteers is a way for a country to send land and air forces to fight in the wars of other countries without joining that war itself. It is a great way to gain Experience in the years before major wars break out and for a country to influence the outcome of a war without becoming diplomatically involved. Volunteers can also be used by a player to field test a division template in combat conditions. Volunteers are controlled, supplied and reinforced by the country that sends them, not the country that receives them. Sending Volunteers increases World Tension. A nation can only have Volunteers abroad while not at war. The ability to send Volunteers is limited by Ideology and World Tension, where Fascists can do so whenever they like and at the other extreme Democracies are fairly limited. France has an ability to do so earlier. In order to send Volunteer divisions they must first be formed into an army. They may be assigned a commander, who can earn experience and traits as well. They are then sent through the Send Volunteers diplomatic action. Once the army arrives, a new army theatre is created for the player and the Volunteer army group is automatically added to it. Armies cannot be transferred to or from these special theatres, even if other countries have volunteers from the same source. It takes two weeks for a Volunteer force to travel to the receiving country or to return. They return home if their home nation finds itself at war or the country that received them finds itself at peace. When volunteers return, they bring 95% of their equipment with them. The remainder is lost in transit or remains in the destination country. Volunteer divisions can also be disbanded, which returns the manpower and equipment to the sending country, but requires a new division to be formed and trained to replace the disbanded one. The number of divisions that can be deployed is 1 division for every 20 active divisions (rounded down, so with 19 or fewer no Volunteers can be sent). For example 176 active divisions means 8 divisions where 181 would mean 9 divisions could be deployed as volunteers. Note that a division with only 1 battalion in it counts as much as one that has 25. The minimum of 20 divisions with 1 infantry will enable 1 volunteer division to be sent. The sending country must have at least 30 divisions to send volunteers at all. Added to this is one division per 20 provinces in the destination country. Volunteer air wings are subject to similar restrictions. However, they are sent by using the air interface to directly relocate them to an airfield in the destination country, after which the player may set up their orders normally). Sending Expeditionary Forces is a way to hand over troops to allies in war. It is useful if the player doesn’t want to control them, or if AI wants to fight in a theatre and thinks the receiving player will do a better job. They can be handed over and returned at any time. Disbanding an expeditionary division has the effect of returning it. AI will often ship them as well if it has convoys available. The current game fixed anomalies with Expeditionary Forces. They get their equipment and manpower from their home country, not the recipient. The recipient has full control of them until returned. Testing shows that war score for occupation by an Expeditionary Force goes to the country controlling them, while war score for casualties goes to the home country (the one providing the Expeditionary Force). Expeditionary Force divisions can gain experience but their template may not be modified by the receiving country. Players receiving Expeditionary Forces may wish to provide Lend-Lease shipments to the home country of equipment types that it may use to supply the Expeditionary Forces. Some other open topics for investigation and testing are how the army experience generated by the Expeditionary Force in combat or in military exercises is allocated, and confirming the manpower and equipment effects of template changes by the home country. Please help improve this article or section by expanding it with: a list of the avaiable war goals. Italy selecting a war goal against Switzerland. A war goal is needed to declare war. A war goal is usually a conquest of a desired state. Justifying a war goal costs political power, increases world tension and usually takes between 6-9 months to complete. When a country has a war goal, it can start a war against the target country. Countries succeeding in their war goals get an advantage in peace conferences. There are several national focus that will give countries historical war goals. However, ahistorical war goals are also possible, such as Sweden restoring its historical borders. The target state of the wargoal can be claimed at a discount at the peace conference. Besides the national focus, war goal justification will require one or multiple conditions to be met before it can even begin. The conditions will be different depending on the ideology (Communism, Democracy, Fascism or Non-aligned) as well as the faction (Allies, Axis, Commintern, others) and the World Tension level. Communists have virtually no restriction on justifying war goals. Democracies are very limited in how they can begin wars, to simulate the influence of popular opinion during the time period. These limitations are lifted if a country becomes fascist or communist. Cannot start a war against another democracy. Cannot justify against a nation that has not increased the world tension. If a fascist country is already at war with a major power, they can justify a new wargoal 80% faster than normal. All ideologies have one or multiple effect on the cost of war goal justification or enactment at the peace conference. 30% cost reduction when puppeting other countries. Cannot occupy a country without war (captured neutral territory will be returned). 25% cost increase of Taking States. 50% cost increase of Annexing country. Can occupy a country without war. It's necessary to spend a certain amount of political power to start justification of a war goal. -90% When justifying war goal against a major power at war. Once the justification is ongoing, It will also be necessary to spend 0.2 political power per day on the war goal justification to complete it in the minimum number of days. Any deficiency in political power will stall the war goal justification. Control of a province changes when the first division of a country at war with the current controller enters the province while no defenders are present. This usually happens after the attackers won a battle or because the province was undefended to begin with. Divisions may enter from a neighboring land province, via paradrop, or naval invasion. Control can potentially pass to any eligible country subject to the following rules. A country is eligible if it is at war with the original province controller and has given military access to the division's country, either explicitly or by being in the same faction. In all cases except the neighborhood rule, control passes to the master if the selected country is a subject. When an owner loses control of a state completely (i.e. when losing the last province) and the new controller controls an adjacent state as well, they gain full control of the state. Otherwise the surrounding states' controllers are checked for co-belligerent faction members of the new controller. If any are found, the state gets handed over to the one with the largest industry, with a slight bonus towards the faction leader. Members of the same faction can explicitly pass control of states among each other with the diplomatic actions "Give control of state" and "Ask for control of state". AI allies will generally only agree to this if they consider their own share of controlled states large enough and the share of the other country not too large. ↑ For example if China is fighting with Japan and its puppets and win the war after Japan joined the Axis, but before Germany and Italy join war, Japan will be annexed. This page was last edited on 11 February 2019, at 17:21.